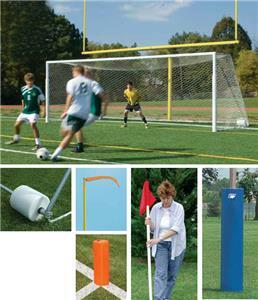 Bison Collegiate Complete Football & Soccer Combination Goal Packages. Make your buying decision easy and save money, too...Buy your football goal posts and soccer goals in guaranteed compatible packages. Package includes all the goals and accessory components to play high school or collegiate soccer and football including. Bison Collegiate Football & Soccer Combo Goal Pkg.